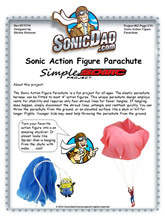 The Sonic Action Figure Parachute is a fun project for all ages. The elastic parachute harness can be fitted to most 4? action figures. This unique parachute design employs vents for stability and requires only four shroud lines for fewer tangles. If tangling does happen, simply disconnect the shroud lines, untangle and reattach quickly. 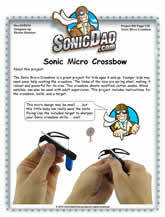 You can throw the parachute from the ground, or an elevated surface like a deck or hill for longer flights. 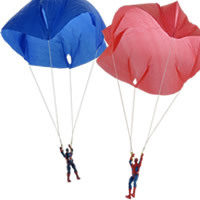 Younger kids may need help throwing the parachute from the ground.